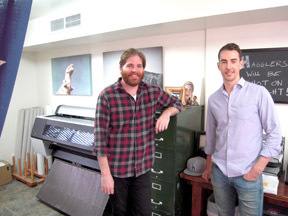 CANVAS SHOP’S proprietors Weston Dixon and J.R. Riggins. Old-fashioned service and cool wall art are in abundance at Canvas Shop, which opened last month at 500 N. Larchmont Blvd. Bring photos or download your favorites of puppies, wedding and travel shots, anything really, and watch proprietors Jon-Ryan (J.R.) Riggins and Weston Dixon work their magic… on site. Everything is done from start—consultation—to finish—gallery-quality varnished canvas—at the “boutique-style” shop. “We care about the product,” says J.R., co-owner. The best results come from an ordinary high-resolution photo, say something snapped with an iPhone. But the top-notch color quality is in the printing. Two 44”-long printers (in case one breaks down) show accurate colors, so the finished product is not a surprise to the customer, says Weston. Not to be confused with a home office printer, these enormous machines have lots and lots of settings to get the image just right, he adds. The pair moved their budding two-year business from downtown L.A. to neighborly Larchmont. Interested in printing personal photos on canvas—but unable to find a capable facility, he contacted his friend Wes, who had been working in the printing industry for a decade. The rest is photographic-wall art history as celebrities and artists but mostly folks like you and me brought in their personal snapshots, or more likely their Instagrams. With smart phones and the latest technology at their fingertips photographers are growing in numbers. Vintage-style frames are available and multiple photos can be combined reminiscent of arcade photo booths. Whatever you choose for your new work of art you can watch it being made at your neighborhood corner shop. You can also visit them online, at www.canvasshop.com.